Good morning, folks. As promised, I’m back with a third variety from the Rocky’s Hot Sauce lineup. This time, I’ve got the brand’s Garlic flavor, and I’m really excited. See, I love garlic, and I’ll eat it whenever feasible, short of actually popping a bulb in my mouth. Sure, people tend to be put off by the less-than-pleasant breath it creates, but garlic makes a great addition to countless dishes, and hot sauce is definitely no exception. Now, this job has given me many opportunities to become acquainted with garlic-style hot sauces, but I have greatly enjoyed the Rocky’s lineup thus far. I’m anxious to see how this stacks up to my current favorite garlic-flavored sauce, so let’s dig in. Unlike the BAR-B-QUE variety’s ingredients list, this one actually has a few important differences when compared to the Original. First, the second main ingredient in this one is the venerable cayenne pepper, which tells me that Rocky’s is definitely aiming for more heat here. Another interesting hint in that direction is that the capsaicin (extract, I’m assuming, though this bottle doesn’t explicitly say, unlike its brothers) is placed slightly higher on the list. While both of the other Rocky’s sauces I’ve reviewed had capsaicin extract, the unappealing extract flavor was not at all a factor in either of them, so here’s hoping that trend continues. This stuff looks pretty darn identical to the Original flavor, with the standard red-orange hue that is common in the hot sauce world. The Garlic flavor also has the orifice reducer and a label similar to the rest of the line. Cayenne, vinegar, and garlic. Those are the ingredients you’ll smell in this product. None of that is surprising or innovative, but there’s no shame in taking something common and improving on it, which seems to be Rocky’s intent. Besides, that’s a mouthwatering combination. The vinegar isn’t too present in the flavor, so that’s another plus, Instead, we get a strong hit of garlic and cayenne, with a pleasant aftertaste that sticks around for a while. Take every nice thing that I said about the Original flavor and make it even better. The heat on this one puts in neatly in the Mean territory, though it is a little bit hotter than the Original, thanks to the extra emphasis on peppers. It’s also worth noting that the burn lasts a bit longer on the Garlic sauce. Likewise, the Garlic beats the Original in flavor as well, scoring a Notable in my book. It’s definitely a delicious hot sauce. If you’re like me, then a garlic-flavored hot sauce might as well be a general table sauce, because so many things can benefit from a little extra garlic flavor. If you want to keep things simple, it would make a great topping for a side of noodles or rice, or even as an alternative dressing for a spicy salad. Of course, it will also make your meat sexier than ever. I bought a chicken patty that’s been smothered in Hatch green chiles, and I need to go cook it so I can smother it with this sauce. 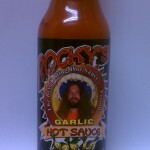 If you checked the link above to my previous favorite garlic-based sauce, you can see that Rocky’s Garlic won a decisive victory in both heat and flavor. Folks, I have a new favorite garlic sauce, and that’s a great way to wrap up the end of my first year here at EAT MORE HEAT!